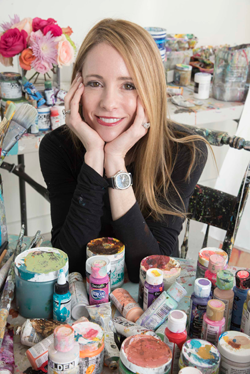 Kim Schuessler is one of the most popular figurative painters in the southeast. She recently moved from Hong Kong and now lives between Puerto Rico and Atlanta...Her southern roots, extensive travel and love of fashion influence her paintings. Sourcing paper from each destination she visits, she employs color, texture, and pattern to create collages and paintings that connect the viewer to everyday experiences. Her complex collages evoke a sense of human emotion that speak of joy and love. Having been born and raised in Georgia, my southern roots run deep and you can even hear it when I speak. As with most Southerners, my faith is strong, my family comes first and I'm passionate about my work. The world has many distractions and choices, but I define success as the ability to stay focused on well intended goals. I have traveled, studied and lived in many places around the globe from Hong Kong to Puerto Rico. I have found that although the scenery and cultures can be extreme in their differences, much remains the same. We all need someone to love, something to hope for and goals to achieve. My paintings depict these common essentials as I illustrate couples dancing, families celebrating and friends standing together. Visually, I am inspired by colors, patterns, fashion, fabrics and PEOPLE. I studied art abroad in France and Italy, attended Parsons School of Design and graduated with a Bachelor of Fine Arts From the University of Georgia. After my undergraduate studies, I earned an Arts Education degree and taught art in a Public school. I have pursued art for the past 23 years and each day I keep discovering, changing and creating. With each painting, I fall more deeply in love with communicating through my art. To date, my greatest sense of accomplishment has been seeing people enjoy my works at places I never imagined ... the Hank Aaron Museum, the Atlanta Botanical Gardens, the conference room at Spanx and in periodicals such as “Pink” and “Better Homes and Gardens.” I am an optimist who wants my audience to pursue their passion, to find joy in everyday occurrences and to cherish those they love.